Another of my friends is in the process of moving so another housewarming card is called for. I don't know why I have such a mental block but I find such cards very difficult to make! This one started with the wonderful new embossing paste and one of the Pattern party masks. The paste is so light and easy to use that it was very simple to use only a few of the clouds as well as to control the amount of paste in each cloud. For some of them I used quite a lot of paste, swirling the top to create fluffy white clouds and others I spread more thinly so that some of the blue from the paper showed through. 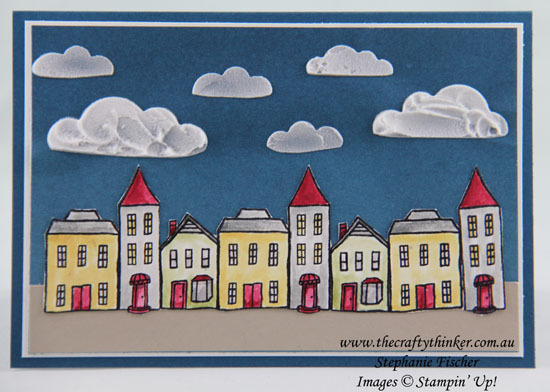 I stamped a row of buildings with Basic Black ink onto a spare piece of Whisper White card and watercoloured them (yes, I could have coloured them with the two-step stamping process but I really enjoy watercolouring!). 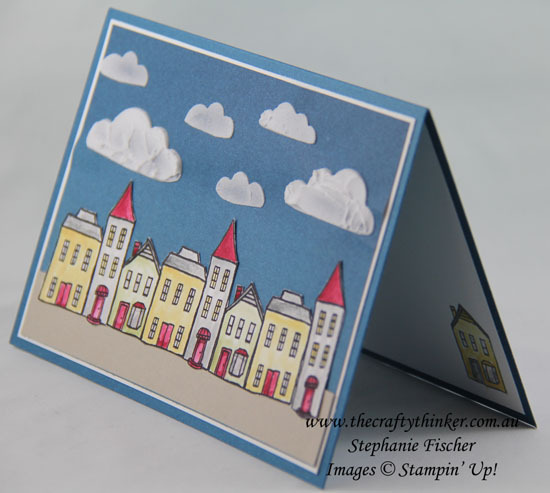 Having added a strip of Sahara Sand card to the bottom of the card, I cut out my row of buildings and glued it on top. I added a Congratulations greeting and another house to the inside of the card.